Black Diamond is a small place with big BBQ. It doesn’t seat many people inside but it has a beautiful out-door area. We opted to stay inside to avoid the sun. They offer $6.99 lunch specials,which consist of a sandwich, side and drink. We opted for something more substantial with meat on a bun dinners. Pat got his usual pulled pork sandwich with sauce on the side. Normally I get a taste of whatever Pat is having,but this time I had enough on my plate just to finish. The portions we received were huge. I would guess 8 ounces each. I got the beef on a bun with beans and home made coleslaw. As I said the portion was huge, and since I opted for sweet sauce directly on the sandwich I had to use a fork to eat it.
. The beans were so so but the slaw was a nice tart and creamy counterpoint to the sweet sauce. So all in all I can’t think of any reason not to like this joint’s food. They also have pie and cobbler on weekends. They are in a great location too. Right off Binford Blvd. Easy access. And the prices are more than reasonable. We ordered 2 dinners and they were about $ 11 each. Like I said a good place to visit. King Rib’s is an old-time local chain of BBQ joints. They have four restaurants, and according to some folks this is the best. I don’t know about that; but this place is pretty darn good. This is their “smoking” area. They have three of these bad boys out back. It has fencing all around so you can’t really get too close. I took these shots from the car, only because it was too cold to get out. They have a small and sensible menu, featuring smoked meats, a few sides and pie. That is probably one of the reasons for their success and longevity. 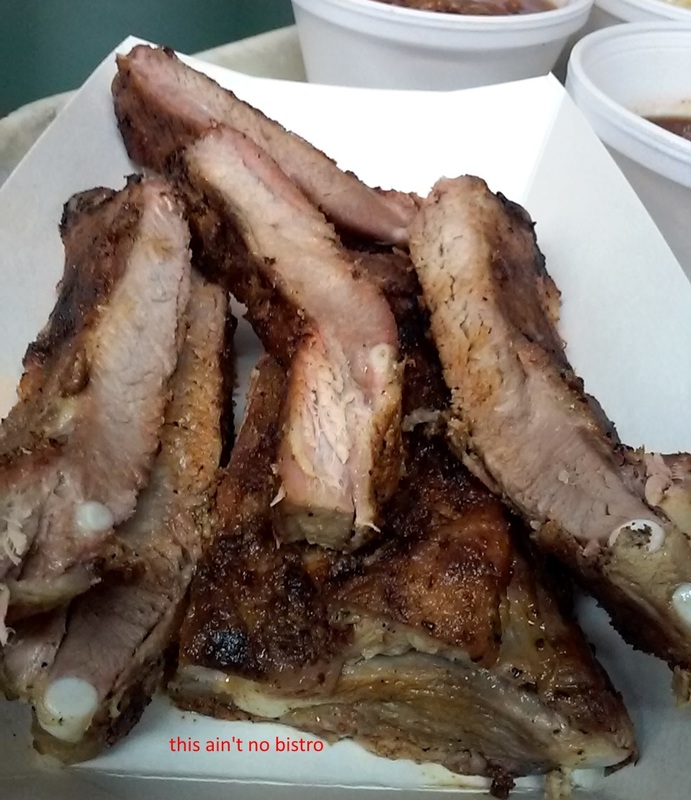 Pat’s ribs were big, meaty and cost 9 bucks and change. No sides. I decided on their Tuesday special. Rib Tip dinner with two sides for less than $8.00. Their prices are more than reasonable. Especially when you factor in the amount of food you get. They offer their sauce three ways. Mild, hot and mixed. I ordered my tips with mixed. I also got mac and cheese and baked beans. I read one review that suggested that their sides were their weak link. Well I am not sure I necessarily agree. The beans were tasty, just not as thick and gooey as I like. As for the mac and cheese it was more than passable. There are better examples out there. Unfortunately more, that aren’t as good. Now as far as the main act goes it was right on point. In addition to being a generous pile of meaty and tender pieces it had an excellent smoky presence. The sauce they prepare is thinner than the more Southern style. But it had enough leg to cling to the meat. All in all I think it was a stellar example of the smoking art. One last thing; the pie. They have Chess Pie and Sweet Potato Pie, both made in-house. Both $2.25 per slice; $8 for a whole pie. I had a piece of Chess pie. Wow. It was good. Very good,and very sweet. So we thoroughly enjoyed our lunch. Good food with good prices. Just make sure you save room for pie.